This full day tour is suggested to people interested in Roman history. You will go along one of the two main Roman counselor roads, Via Annia. Built in 131 b.C. (? or 153? or 128?) by Praetor Titus Annius Rufo, it started from Adria and reached Aquileia along the North-East Italian coast. You will visit Altino and its National Archeological Museum, built inside a huge archeological area. During the way, we will visit the ruins a Roman bridges situated in the country land in Ceggia; then Iulia Concordia, now Concordia Sagittaria, important Roman colony founded in 42 b.C., which is considered to be the second biggest early Christian center after Aquileia. 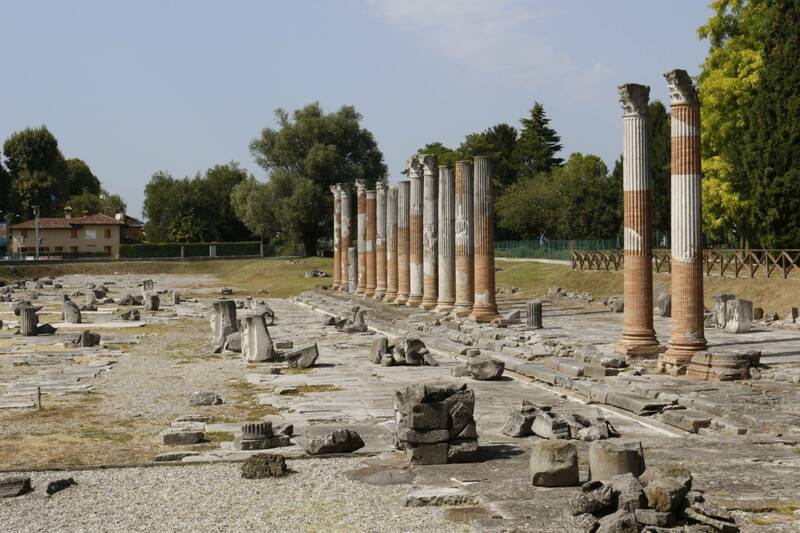 The last stop will be Aquileia, which is called “Northern Pompei” for the quantity and quality of Roman ruins. There you will have the opportunity to visit the impressive 750 sq.m floor mosaics of the Patriarchal Basilica, the biggest in the Occident. 09:00 Departure from your hotel for a comfortable journey with our minivan to reach Altino. 09:30 Arrival at the National Archeological Museum of Altino e visit the Roman ruins. 10:30 Departure to Ceggia to visit the Roman bridge ruins. 11:45 Departure to Concordia Sagittaria to visit the Roman ruins and short visit of the centre. We cannot delay departure times of any of our tours/transfers due to late arrivals and we reserve the right to cancel your reservation if you do not arrive at the meeting point on time. If you are unsure of meeting points, please do not hesitate to contact us for guidance. Refunds cannot be provided for non-arrivals. Please wear comfortable walking shoes. The service is confirmed with minimum 4 places purchased, this is a shared day excursion. For a private service please contact us.